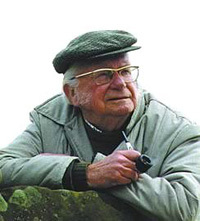 'Alfred Wainwright (1907-1991) will always be known for his famous Pictorial Guides to the Lakeland Fells which he compiled between 1952 and 1966. These handwritten and hand-drawn works of art have given inspiration to all true fellwalkers for the past forty years. For this labour of love, as he called it, he was awarded the MBE. The inaugural meeting of 'The Wainwright Society' was held on November 9th 2002 at Ambleside Youth Hostel. This was followed by a walk to the summit of Dove Crag, as AW had done 50 years before. The primary aim of the Society is to keep alive the things which AW promoted through the guidebooks, started over 50 years ago, and the many other publications which were the 'labour of love' of a large portion of his life.